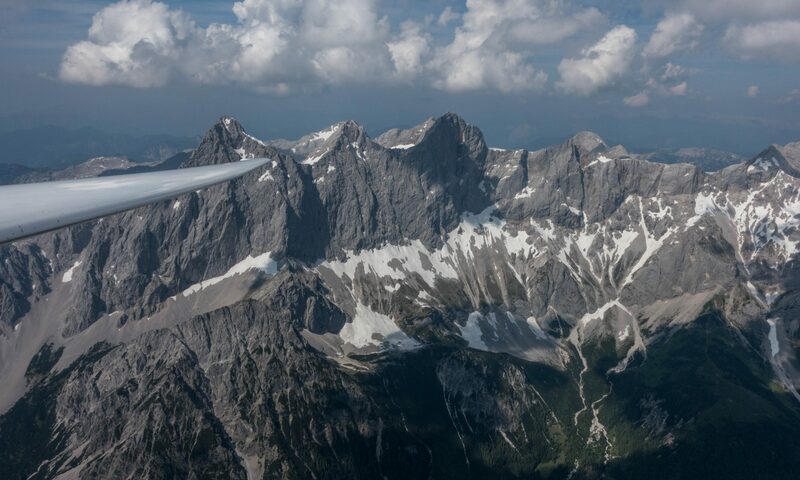 One of the advantages of soaring in the American West is that frequent cloud bases of 18,000 feet or more allow for significant flight distances without ever leaving the glide radius of the home airport – especially if you’re lucky to have a high performance plane. E.g., let’s say you’re flying a ship with a glide ratio of 40:1 from Boulder, CO. The airport elevation is 5,300 feet. Pattern altitude is 6,300. That means on good thermal days you often fly 11,000 feet or more above pattern altitude. And 11,000 feet of altitude at 40:1 equates to a glide distance of more than 80 miles! This means, at least in theory, you can start a final glide at 18,000 feet MSL above Pikes Peak to the west of Colorado Springs and reach the Boulder airport 700 ft above pattern altitude – provided that you’re flying at optimum glide speed and absent any sink or headwind. Reality isn’t usually so kind, i.e., you’re not able to maintain optimum glide speed, there is at least some cross wind component to deal with, and you’re spending more time in sink than in lift. Therefore it’s prudent not to rely on a glide ratio that’s better than half the theoretical maximum. But even that gets you home from 17,300 ft MSL above Mt. Evans, or from 17,300 feet above the northern-most corners of Rocky Mountains National Park. In other words, on days with high-reaching thermals (not uncommon) you can fly more than a 200 km FAI triangle without ever leaving the glide radius around Boulder. In my first 9 months of soaring from Boulder I have largely stayed within this “glidable” area. Having acquainted myself with the area I feel it’s time to start venturing beyond these confines. One of the motivating factors are the remarkable differences in soaring conditions in Boulder’s vicinity based on the overall weather situation. This past Wednesday provided a great example. Boulder lies directly at the foot of the Front Range of the Rocky Mountains. Usually a dry air mass dominates to the west of the mountains, whereas a more humid air mass lies above the flat prairie to the east. These two air masses tend to have different characteristics in terms of moisture content, temperature, wind direction, atmospheric pressure, etc. The western airmass is typically pushed eastwards by the prevailing westerly airflow whereas the low level winds over the plains tend to come from easterly directions. As the morning sun heats up the east facing slopes over the foothills, this easterly flow is augmented by convective activity, pulling in yet more air from the plains. Where these two air masses meet and mix – usually somewhere over the hills in the vicinity of Boulder – the soaring conditions can get very complex. On Wednesday, a south-westerly mid- to upper-level flow pushed dry air up and across the Continental Divide. The air above Boulder was more moist and the temperature gradient was very stable. A typical morning inversion lay over the plains. The skies were blue and the sunshine intense but at 11:30 AM any lift over the city of Boulder still topped out at less than 1,000 ft AGL, trapped by the inversion layer. Some wisps had formed over the foothills but they seemed to be short-lived. The only nice cus could be seen some 30-40 miles to the north, inaccessible by glider from Boulder. As so often, Skysight had projected the convergence between the western and eastern air masses to follow a line over the foothills, parallel to the Continental Divide. In the morning this line was supposed to be approx. 10-15 miles east of the Divide and over the course of the day, it was projected to gradually shift westwards – I assume due to the fact that increasing thermal activity over the hills would strengthen the easterly airflow and push the convergence further back towards the mountains. Thermals to the east of the convergence were projected to be weak, especially between Golden and Fort Collins. By contrast, much stronger conditions were forecast to the south of Mount Evans with particularly strong thermals along the foothills between Denver and Colorado Springs, and along the southern end of South Park towards Salida. I tend to think that this difference has to do with the fact that the Front Range is much higher to the north or Mt. Evans than to the south: where the mountains are high they slow down the westerly flow and the air from the east can penetrate further westwards. Where the Front Range is lower (to the south of Evans), the westerly flow is stronger and prevents the easterly air mass from penetrating westwards. The following sketch illustrates what I think the situation looked like in the morning on April 16. My limited experience suggests this situation is pretty common in Boulder so I think it’s worth capturing it for my own learning. Approximate situation in the morning of April 16, 2018. This seems to be a relatively frequent scenario in Boulder. – better (but not great) thermals could be expected to the west of the convergence line. However, because this area is in the lee of the Rocky Mountains, these thermals would likely be turbulent and there could also be significant sink in-between them as air would spill down the mountains (shown in orange). – much better lift could be expected south of Mount Evans (in the red shaded area) because the south westerly airflow could bring the dry westerly airmass into this area. Note how the convergence line shifts further east. Due to the wind direction from the SW this area would also not be subject to lee-side turbulence and sink. The best lift would likely be along the lower, west-facing slopes on the east side of South Park, especially after noon when the sun would warm these slopes most directly, and the wind would help to break the thermals off from the slopes below. Given these projections my plan was to try to get towards the south. If I could make it past Mount Evans, I expected to find much better conditions there. If all went well, I might even make it all the way to Pikes Peak, and maybe from there into South Park towards Salida. Knowing that this plan could take me well beyond conservative glide ratio calculations, I had researched the airfields to the south of Denver as well as a few potential off-field landing spots between there and Boulder, as well as in the area around South Park. If the intent was to go south, the question was how to get there. It was around 12:45PM when I took a tow. I released near Crescent Mountain (just south of the Flatirons) where I only found a very weak climb that topped off at 11,000 ft. But it was high enough to push to a promising-looking cloud SE of Thorodin mountain where I climbed in 3-4 kt thermal lift to 13,000 ft. This lift was still on the east side of the convergence line: the wind drift in this thermal is clearly from east to west. The additional altitude allowed me to move a few miles further to the SW where I noticed a cloud with a higher cloud base. This time I aimed straight to its western edge. And indeed: I had made it to the west side of the convergence line where I could expect higher thermals and better climb rates! The direction of the wind drift was a sure sign that I had made it to the “right” side of the convergence. The climb rate was also significantly better at approx. 8 kt. In only 5 minutes I had gained another 4,000 feet and was now at cloud base around 17,000 feet, ready to push further south. Notice the yellow arrows depicting the opposite wind drift when circling southeast of Thorodin Mountain and northwest of Ely Hill: The climb near Thorodin mountain is in thermals on the east side of the convergence line: the wind drift is from the east. The climb near Ely Hill, just a few miles further southwest is on the west side of the convergence line: the wind drift is from the west. So the convergence line must have roughly followed a line from Thorodin Mountain to Ely Hill. I passed Mount Evans, following a row of clouds along the eastern rim of South Park, headed towards Pikes Peak. Unfortunately the clouds ended and the sky turned blue when Pikes Peak was still 30 miles away. This was clearly too much for my comfort zone and so I decided to turn and backtrack towards the NW. 20 minutes later I was back on the south side of Mt Evans. Now the clouds looked better towards Pikes Peak and I decided to make another attempt. This time I got within about 20 miles when, once again, the clouds came to an end. Once again I decided not to take the risk. Circling southwest of Cheeseman Lake, above pretty but quite inhospitable-looking terrain. From there I headed north intent on seeing if I could fly the convergence line past Boulder to the north towards Wyoming, despite the much poorer thermal forecast for this area. This turned out to be impossible. Once I was north of Mt Evans, the conditions deteriorated quickly. For a while I could still make out the position of the convergence line by looking at the positions of some interspersed clouds with different cloud bases but once I got to Ward thermals were few and far between, climb rates had deteriorated, and there was no viable way forward in sight. Instead, I decided to head west towards an emerging cloud that was just west of the Continental Divide. I pushed through heavy sink in the lee of the mountains and crossed the Divide at just below 15,000 feet MSL. There was some ridge lift from the westerly winds along the divide, but 2,000-3,000 feet above the ridge it was just sufficient to maintain altitude. The cloud was another few miles further west. Exploring ridge lift over the top of the Continental Divide. I had to decide between heading back towards Boulder, i.e. flying back through the lee-side sink with very poor prospects of connecting back up to cloud-base, or taking the risk of pushing for the cloud, firmly on the west side of the divide. Given that Granby Airport was clearly within reach I decided to take the plunge and continued towards the west. I got to the cloud – the only one around at that time – but found only very weak lift. It took me 25 minutes to gain 2,000 feet back. Had this been a race, here is where I would have lost it. In the meantime, new convection had formed several miles further south, still on the western side of the divide. Gingerly I continued my way south trying to stay at altitudes that would have allowed me to cross back to the eastern side. A few poor climbs later I was able to fly directly over Grays Peak and Torreys Peak, two Colorado 14ers that I had not passed over before. Circling in weak lift on the west side of the Continental Divide. Keystone ski resort is below. Southwest of Mt. Evans I spotted what looked like a powerful new convergence line that stretched all across South Park. It was already late in the day but the line looked extremely compelling so I decided to go for it. I was not disappointed. In 14kt (!) lift I quickly climbed back up to just under 18,000 feet and from there I had to shift my main focus to staying at legal altitudes. The lift was so strong along this line that I had to open the spoilers at 100 kts IAS to avoid climbing above 18,000 ft. Within 13 minutes I covered 30 miles without losing any altitude – that’s an average ground speed of 220 km per hour. I don’t think I’ve ever flown a glider this fast! View of South Park from the east rim, much earlier in the day. I have no pics of the flight under the convergence line as I had my hands full keeping the ship below 18k feet while flying at 100 kt IAS. Given the late hour in the day I didn’t go further south than Jefferson before returning back toward the north. I crossed the Divide NW of Mount Evans and continued in the weakening convergence line along the east side of the divide. I flew all the way past Mount Audubon without a single circle (50 miles in just over 30 minutes), took a brief climb to fly over the top of Longs Peak, from where I started my final glide via the east side of Estes Park and Longmont to the Valmont Reservoir and finally back to the Boulder Airport. Final climb of the day before flying over Longs Peak, straight ahead, just below the yaw string. It was a long (five hours) and satisfying flight in very varied conditions where I experienced everything from weak thermals, and weak ridge lift to the strongest convergence zone lift I have ever encountered. It was definitely my greatest triangle flight with a triangle distance of 276 km, and possibly my greatest distance flight overall with 472 km. A link to the flight track is here. If there is a convergence line parallel to the Front Range, getting to the west-side of it is key to climbing high enough to push to the south, past Mt. Evans. Increasing thermal activity through the day may cause the convergence line along the Front Range to move further west as more air is pulled in from the plains, thereby strengthening the lower level easterly airflow. The wind drift when thermaling can be a sure sign whether you are on the east or the west side of the convergence line. This is particularly helpful when there are no clear indicators (e.g. in blue conditions, no different cloud bases, no curtain clouds). Lift along a convergence line can be incredibly powerful. I never before experienced lift as strong as 14 kts average. A glide ratio of half the ship’s maximum seems to be a good rule of thumb when it comes to estimating a safe final glide distance. (Note that this will not hold up in extreme conditions such as heavy lee-side sink, wave / rotor flying, thunderstorm activity, strong headwinds, etc.). There are several things that I did not understand on this flight: Why was the lift to the west of the Northern Front Range so weak? What caused the late-day development of the convergence line parallel to the mountains on the NW-side of South Park and why was the lift there so strong? Are conditions south of Mt. Evans typically stronger when the wind is from the SW? Why did the convergence line to the north of Mt. Evans support climbs to 18,000 until Ward but not beyond?